Check out the recipes: Healthy Cheesymite Scrolls//Healthy Chocolate Crackle Slice (AKA: Lamington Rice Crispy Treats) - more to come this week! Last week, Australia Post announced their Australia Post Legends Award Winners for 2014. This year, the awards have a culinary theme - with Australia Post announcing their Legends of Cooking - Margaret Fulton, Maggie Beer, Stephanie Alexander, Neil Perry and Kylie Kwong. The award winners are recognised for their influence over Australia's food culture and the visionary role they have played in shaping Australia's palate and laying the foundations of our gastronomic success. This year's recipients join the exclusive group of 70 other awarded Legends. The Legends Awards began 16 years ago when Sir Donald Bradman was the first living Australian to be honoured on an Australian stamp. Each legend will feature on a 60c stamp, with all legends featuring in a stamp pack, first day cover and set of maxi cards - as well as a commemorative book called "Australian Legends of Cooking", written by Michael Harden. And you, dearest readers, have the opportunity to win all of these things! 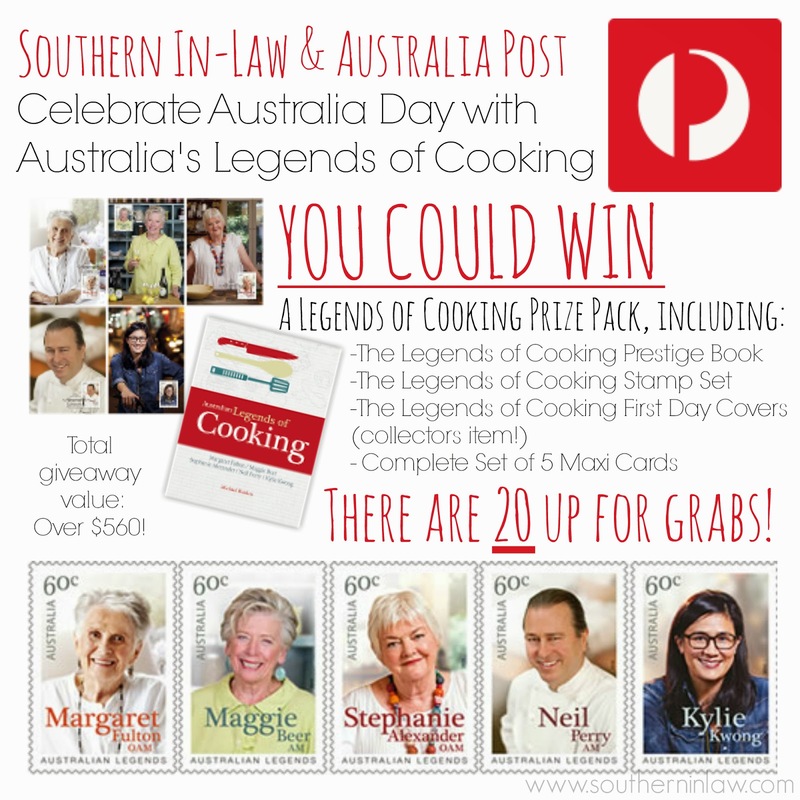 Australia Post, Jesse and I are giving away 20 Legends of Cooking Prize Packs. But how do you enter? How to enter this giveaway! Step two: Leave a comment on the entry post on Facebook telling us What is your favourite Australian Food? Competition is open to Australian Residents and closes on February 11th, 2014 at 11:59 PM EST. The best valid entries will be selected as the winners by Kristy and Jesse and notified via email. Should the winner not reply within 14 days of contact, an alternate winner will be selected. Please note: the winner must be a valid and current liker of the Southern In-Law Facebook page or other relevant social media pages at the time of competition's close. I'm new here and probably a stupid question but here goes. My boyfriend can't stand taste of coconut but I want to try both this recipe and choc crackle.....is there a substitute for coconut oil??? Sorry to seem silly. I know these recipes are all based around health and allergy eating but.....I love your recipes!!! Hey there! Definitely not a stupid question! My sister hates coconut too, but she loved this recipe as you really cannot tell there's coconut oil in it. That said, you could definitely try using butter instead of coconut oil - but you may have to add a little extra honey/syrup to get them to stick together as the coconut oil actually sets and allows the mix to bind. You'll have to let me know how they turn out!